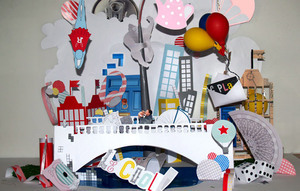 This is a photograph of a 3d paper design of Dublin City I made. 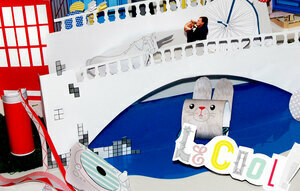 I mainly wanted to do something about the man who saved his rabbit from the Liffey last year, because it’s lovely. So I have him diving into the Liffey to save the rabbit and then again on the bridge giving him a kiss. Then I just wanted to frame that with different little things from around Dublin. Posted in Misc and tagged Art, Dublin, Le Cool Dublin at 11:31 am on January 26, 2012 by Broadsheet.